Value certificates are presented each week at assembly to students in each class, acknowledging and celebrating the values students have reflected throughout the previous week. Our School Values capture what we at Loch Sport Primary School want to instil in all of our students and our staff. Staff throughout the school refer to these values while teaching, and help students to reflect on them to make acceptable decisions when it comes to their learning and behaviour. Value certificates are presented each week at assembly to students in each class, to acknowledge and celebrate values students have reflected throughout the previous week. We are working on our values all of the time to help students, staff and parents know behaviours that are acceptable for school. See links to our policies regarding behaviour, student engagement, and conduct on the policies page. 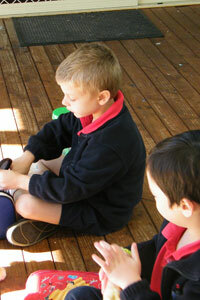 The school uses Assertive Discipline with a focus on positive behaviour. Each class will establish clear expectations and routines at the beginning of each year and revise them as needed. Our school also uses a Gumleaf Reward System to recognise students for demonstrating the values of the school - Respect, Responsibility, Resilience and Safety. Students are rewarded with ‘gum leaves’ which they can then exchange for items from the gumleaf cabinet or accumulate to buy from the Gumleaf Catalogue (e.g free time and extra computer time) or other activities which may be offered throughout the year.